My favorite vacation spot use to be Myrtle Beach. Then my beloved grandparents decided they no longer wanted to be snowbirds and moved south permanently. After that, my new favorite vacation location became Tarpon Springs, Florida. Before my grandparents moved to Tarpon Springs, I had never even heard of this fun Greek town. 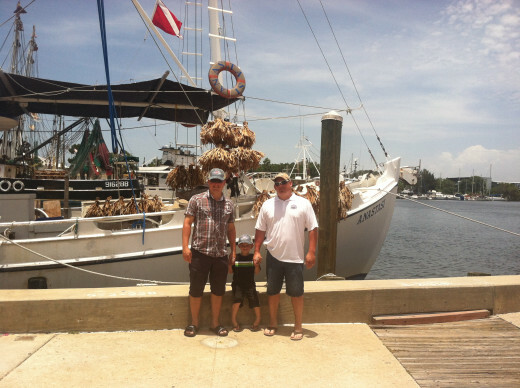 To date, I have been to Tarpon Springs on vacation three times and each time, my summer vacation includes a trip to Tarpon Springs Sponge Docks. 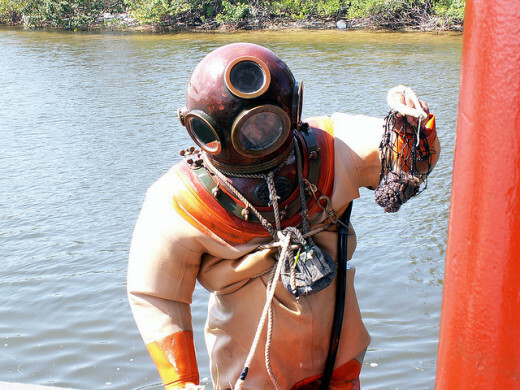 If you are a Mike Rowe or Dirty Jobs fan, Tarpon Springs may sound familiar to you because the Dirty Jobs team visited the area to tape an episode on sponge diving. At first, I wasn't excited to go to an area that seemed devoted to Greek food and sponges, but after my first visit I was hooked. Now, I kind of fancy myself as a Sponge Docks expert and have created this lens to point out the very best places to visit when spending the day at the Sponge Docks. 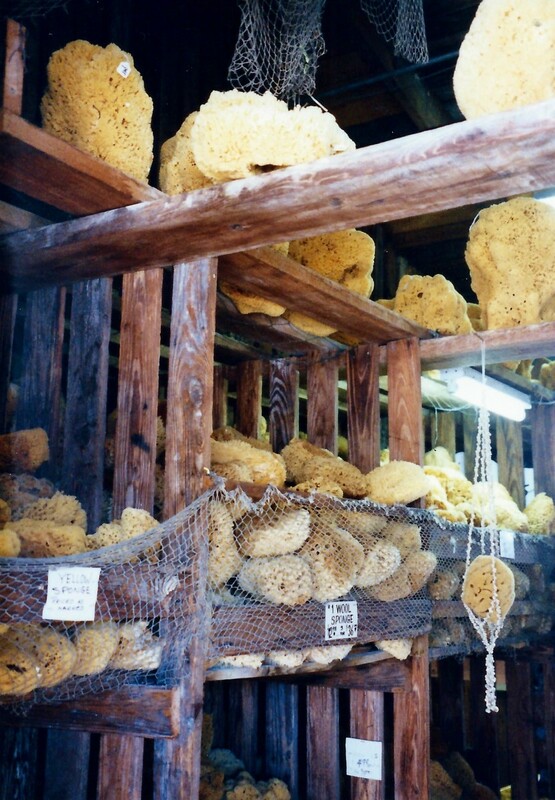 Whether you want a huge sponge, a tiny sponge, a starfish, or an authentic fishing net, you can find exactly what you need in the center of Tarpon Springs. There are many shops up and down the road, but my favorite place to visit is the center of Tarpon Springs. I usually always start on the left to pick up sponges, air plants, shells, and sandstones. The prices here are fantastic, the store owner is awesome, and the quality is fantastic. My husband loves to start here too, but that is because there is a beer stand right next door. Usually, we travel around the entire center and browse all the shops. Here, you can find traditional Greek apparel and lots of souvenirs. Before we continue our trip, my daughter loves to stop at the very center to get a snow cone. Quick tip: While this is my favorite place to start, it isn't my favorite place to shop. Instead, that honor goes to Sponge Diver Supply, but I'll explain that later. Do you Like Gyros? If so, you have to eat at Hellas! During my trips to Tarpon Springs, I have got to taste Greek decadence many times. I'm not usually a gyro fan, but my grandparents insisted I try a gyro at their favorite Greek restaurant, and I can't thank them enough. 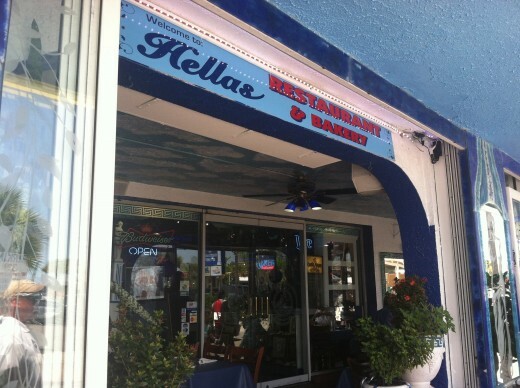 In fact, after tasting many other gyros from restaurants on and around the Sponge Docks, I can confidently say that the best gyro in Tarpon Springs is available at Hellas restaurant. Not only is the gyro here the very best, the service and décor are amazing as well. As soon as you step into Hellas, you will be impressed and your taste buds will be begging for more. In addition to the gyros, I must recommend the mojitos and the saganaki. One of the best parts about the saganaki is that they light it on fire right at your table and everybody yells "OPA!!!!" I hate to sound bias because I just talked about Hellas having the best gyro on the Sponge Docks, but when it comes to authentic Greek baked goods, Hellas is also my favorite. There are many places to get baked goods on the Sponge Docks, but Hellas also delivers an authentic Greek bakery feel and has dozens of choices to choose from. If you don't want baked goods, they have ice cream as well. In fact, you don't have to visit the restaurant to visit the bakery. 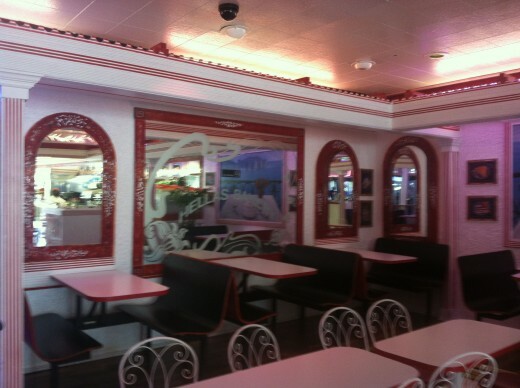 You can walk through from the restaurant or use the bakery's own entrance off the street. My daughter's favorite treat is the baklava and mine is the red velvet cheesecake. Looking for the Best Fudge in America? 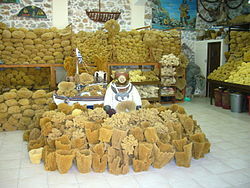 While I love the baked goods at Hellas, a trip to the Sponge Docks is not complete without a visit to The Fudge Factory. This little hut is extremely small and often has a line coming out the door and with good reason, the fudge here is to die for. My favorite is the chocolate peanut butter fudge, but I don't think I have tried a piece of fudge here that I didn't like. The best part is I can carry the fudge around all day and it won't melt. I even packed the leftover fudge in my suitcase and brought it all the way back to Ohio undamaged. Although I have never actually seen manatees while visiting Tarpon Springs, I have talked to many people in my grandmother's park that have. According to them, the best place to see manatees here is located right behind the gift shop that says Gifts on the front. 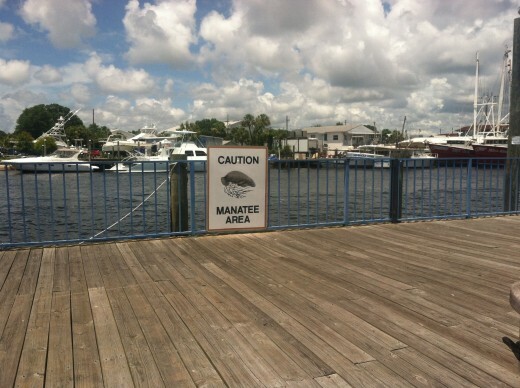 You know you have found the location because of a sign that says manatee area. According to the locals I have talked to, the best chance to see a manatee in this area happens in winter months. 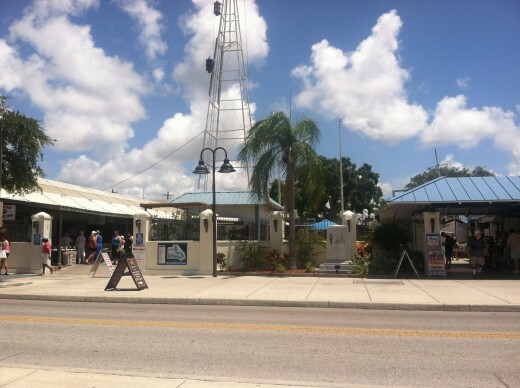 No matter what time of year you visit, a visit to the Sponge Docks wouldn't be complete without a trip to the manatee area. The gift shop is fun too, there are lots of souvenirs and the staff is always friendly. 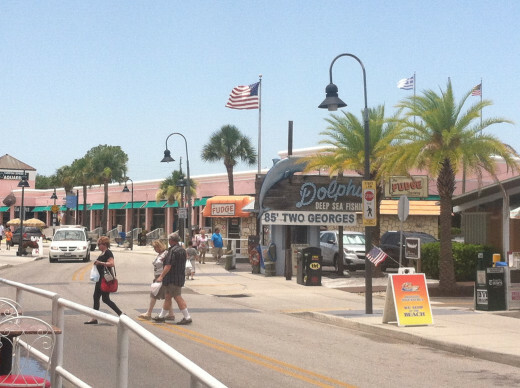 With dozens and dozens of shops to enjoy at Tarpon Springs, it is hard to pick a favorite, but I did. 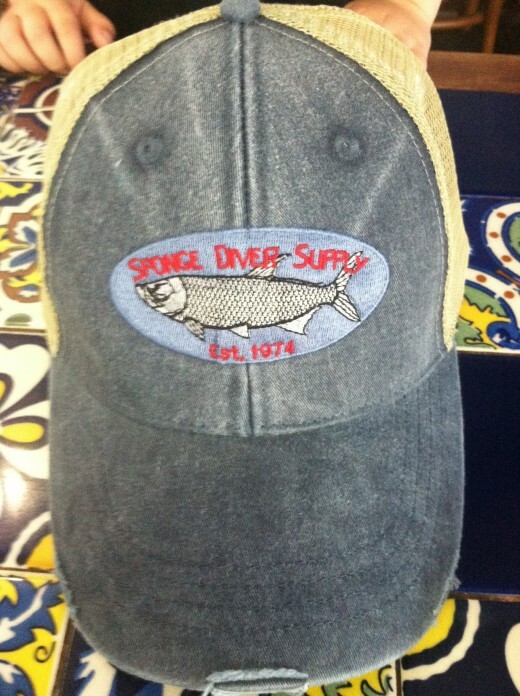 My favorite place to shop is the Sponge Diver Supply. 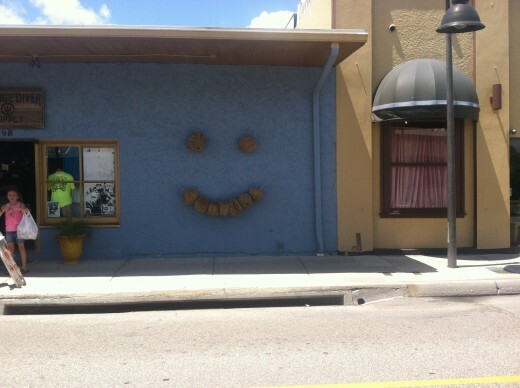 The shop is easy to find because it has a smiley face made of real sponges on the front of its blue building. 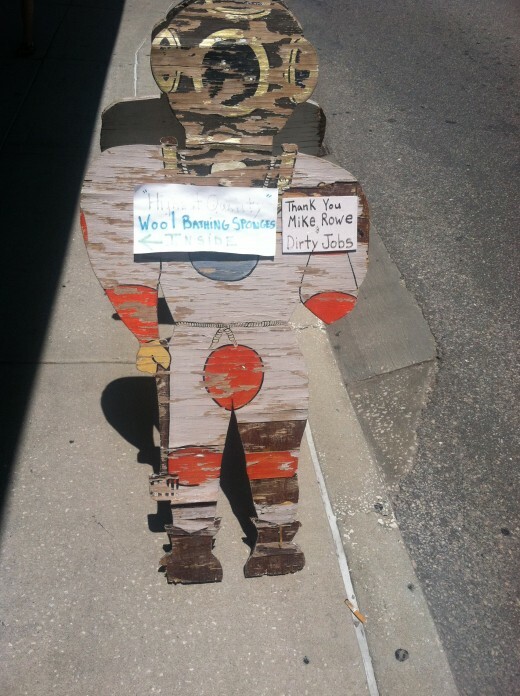 There is also a sponge diver sign standing outside both doors. 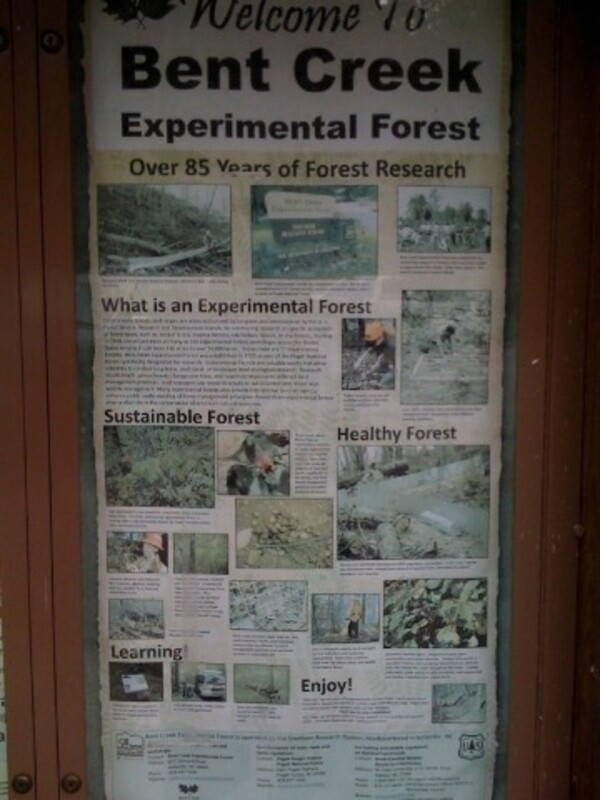 On the sign, there is a handwritten message that says "Thanks Mike Rowe and Dirty Jobs." 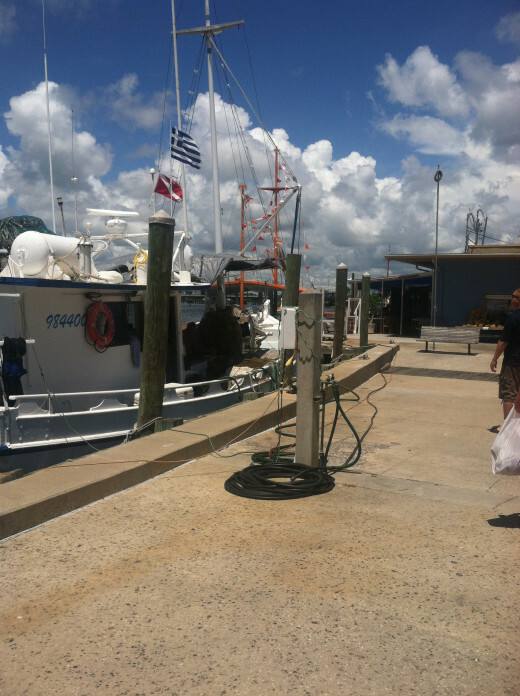 A few years ago, Mike Rowe and the Dirty Jobs team visited Tarpon Springs and went out on the boat owned by this company. For the taping of the show, the owner gave Mike Rowe a Sponge Diver Supply hat and shirt, which Rowe wore during the taping of this episode and once again when he taped an episode for "Deadliest Catch." After which the owner said the shirts and hats became very popular. After hearing this, my husband, nephew, and brother-in-law all had to have Sponge Diver Supply hats. The best part about these hats is that the shop doesn't make any two hats alike. Instead, all of the hats are one-of-a-kind. With all this history and fun facts, this shop is always fun to visit, but what makes this shop stand out from the dozens of others on the docks is the shop's quality. I LOVE everything in this store. It is incredibly clean, fun to browse, and has some of the best quality clothing I have seen in the area. There is a fish tank in the front counter that keeps the kids busy and lots of fun sponges on display all over the store including a sponge that naturally grew to look just like an alligator and one on the front counter that looks just like Gary from the cartoon Spongebob Squarepants. 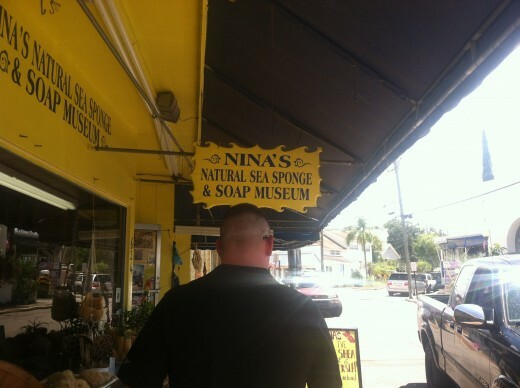 If you step just outside the store, you can opt to go on a sponge diving expedition or just check out the sponge boats and scenery. 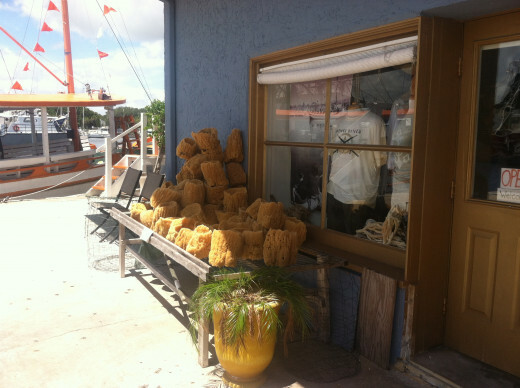 No matter what brings you to Tarpon Springs Sponge Docks, make sure to take a minute to browse the Sponge Diver Supply store and the boats just outside the store. 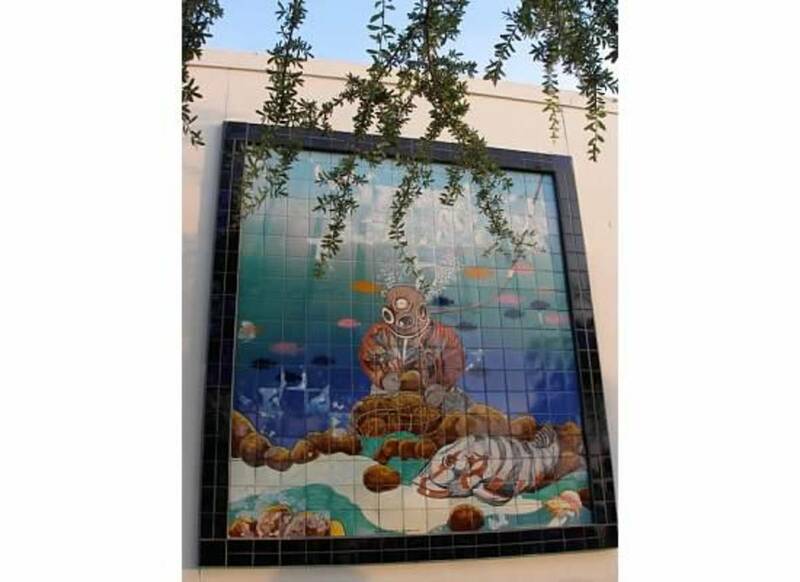 Have you ever been to Tarpon Springs? 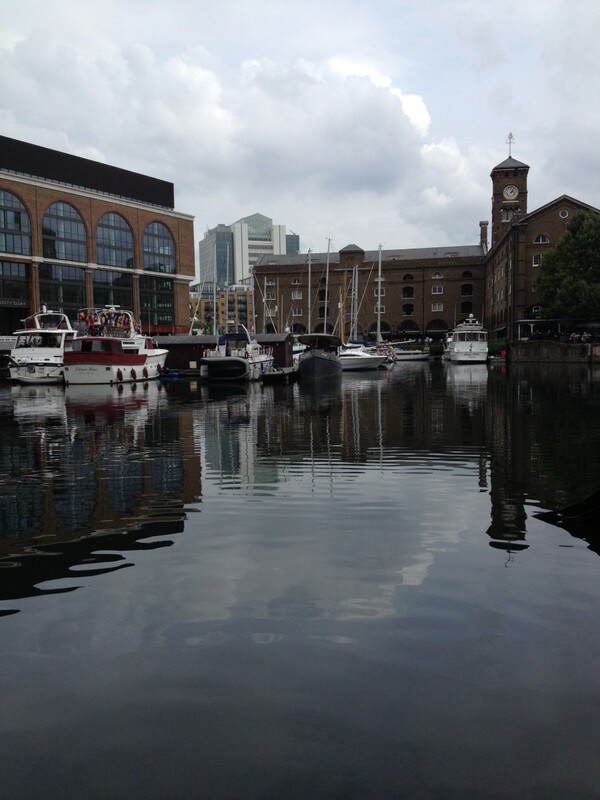 St Katharine Docks - aka St Catherine's Dock - a Place to Visit Near The Tower of London. I have been to the Sponge Docks... and to Hellas! Didn't come home with any sponges, but like you, LOVED the baklava, fudge, and gyros! 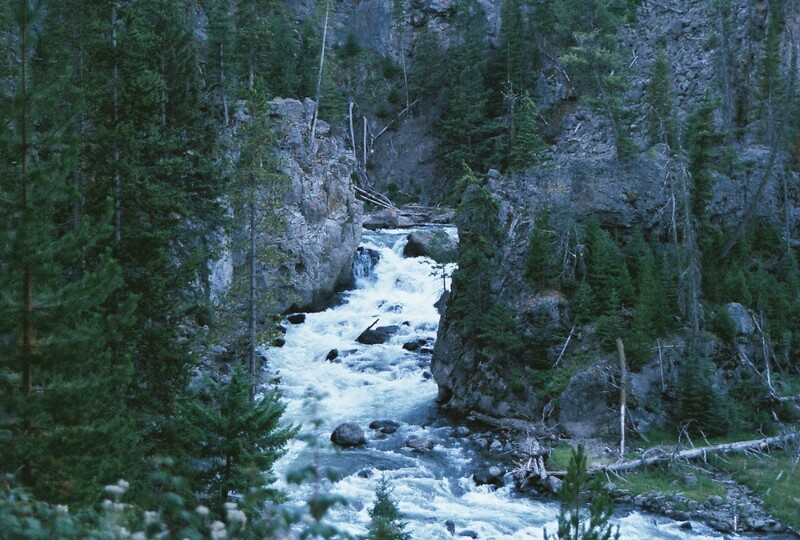 We are planning a return visit this Fall and your article has made me anxious to go back. Thanks for the tour! Good mix of things to see and do. I'd love to see a wild manatee, I'd probably want to stay there until I see one. 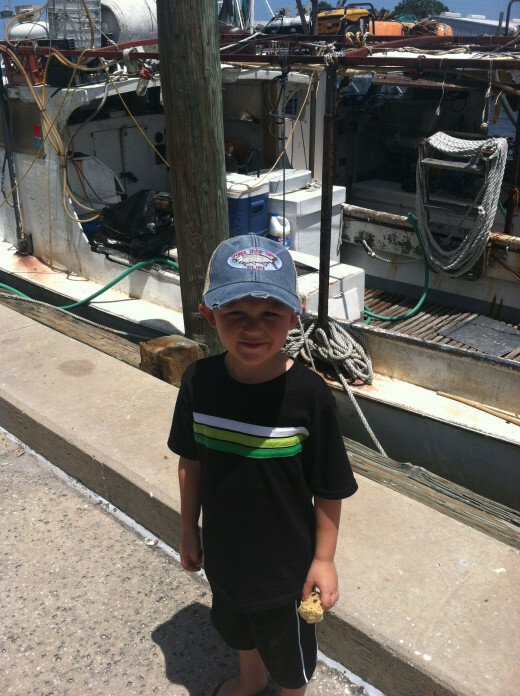 Tarpon Springs has so much to offer. I have visited many times and look forward to another trip next year. Your pictures have captured the area very well. Looks like a fun place to visit - great lens!